To the right >> is a pic of our ever evolving sewing room. 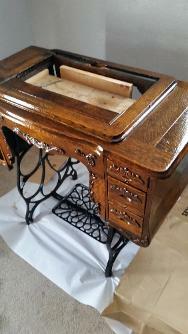 As you can see, machine restoration happens here as well. I love these old machines. 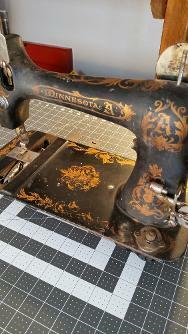 To the right >> is a pic of the Minnesota A Treadle sewing machine. It belonged to Suzi's Great Grandmother. The degree of gunk, grease, and filth we've been removing, strongly suggests that this beautiful old machine was stored in sheds and barns, wherever it wouldn't be in the way, and that for many decades. It is now my distinct pleasure to be bringing it back to life. Suzi and I plan to use this machine. It's over 100 years old, but still works. The machine below is a Singer 115 (I think). There is still some debate about the exact model of this machine. I am about 90% certain that this is a 115, and not a 15-30 machine. After the Minnesota A project, I'll start on making this beauty usable again! Many things come to mind while restoring these old machines. One of those things that come to mind is how little basic machinery changes over the years. Displays and indicators may become digitized rather than analog, and plastic may be used instead of metal, but the laws of physics remain the same. Above ^^^^is the Singer 201-2^^^^up there^^^. 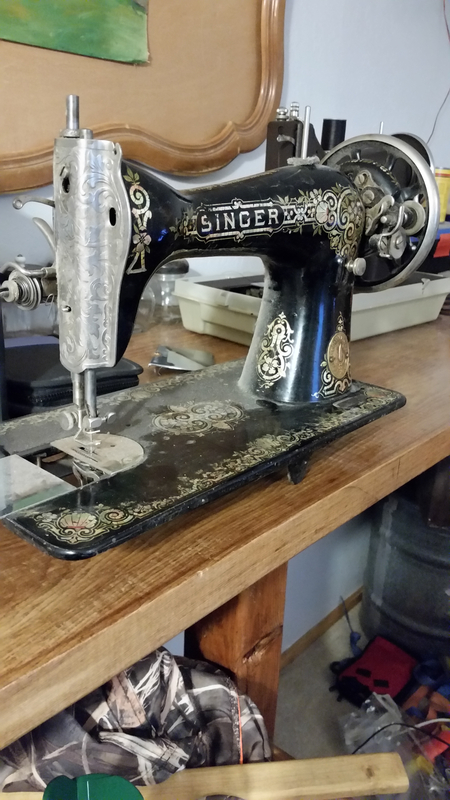 This machine was headed for the dump, along with the Singer 115 listed on this page, when my wife agreed to adopt them. Both these machines were in our storage shed for a few months. 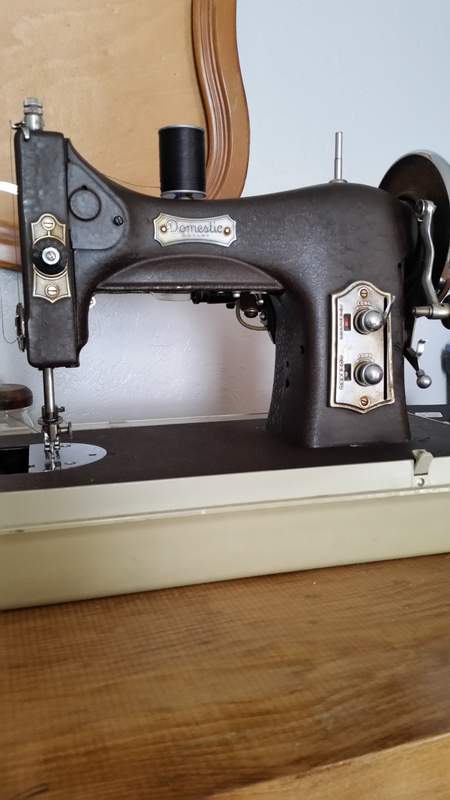 When my beloved Domestic Rotary (listed on this page as well) ceased to function properly at the beginning of the quilting season, I got this one and the 115 out of the shed and began the research and restoration processes. 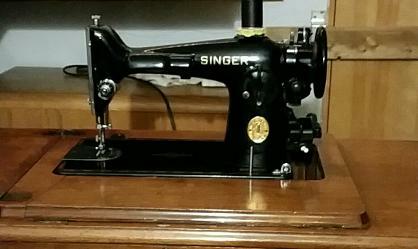 The Singer 201-2 above ^^^ is a better and stronger machine than the Domestic Rotary that I used for 16+ years. I'm very glad the Domestic Rotary forced me to investigate these two machines, this one and the 115 above. To the right >> is the cabinet that I partially restored in the last month or two. It contained the Minnesota A machine that you'll see to the left <<. I modified this cabinet so that Suzi could use her modern Singer 44S in it, while I work on the machine and bring it back to life. At some point, we will reintroduce the original machine into the partially restored cabinet. When we brought it home, it was missing one drawer. One of the top drawers, the shallow ones on each side, was not with it. Frankly, it's a miracle that this machine/cabinet survived the 100+ years that it has. 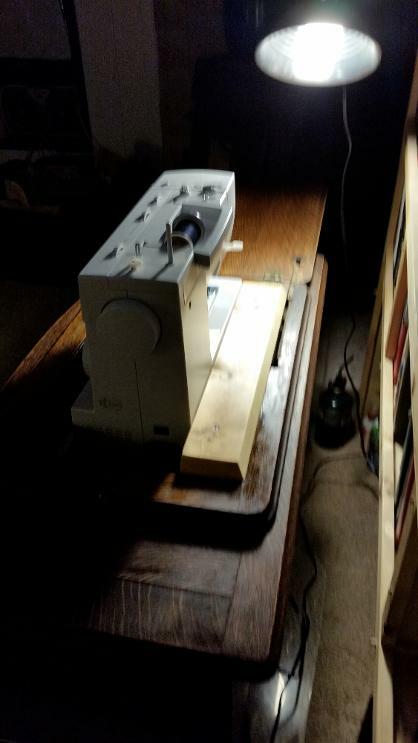 This Domestic Rotary machine ^^^up there^^^ has been my primary sewing machine since March 2000, about 2 months before the heart attack that changed pretty much everything about my life. Only recently have I thought to branch out from this machine and explore other brands and other styles.